This set up guide is to assist in setting up the Gatekeeper mini as supplied by Treshna Enterprises Ltd. Please read this manual carefully before the installation of the GateKeeper and readers. The GateKeeper mini needs to be powered AND connected to the Internet to work correctly. The GateKeeper can ONLY be used to operate desktop readers and receipt printers, which connect to the USB ports. The GateKeeper requires an Internet connection via the Network port to function normally. 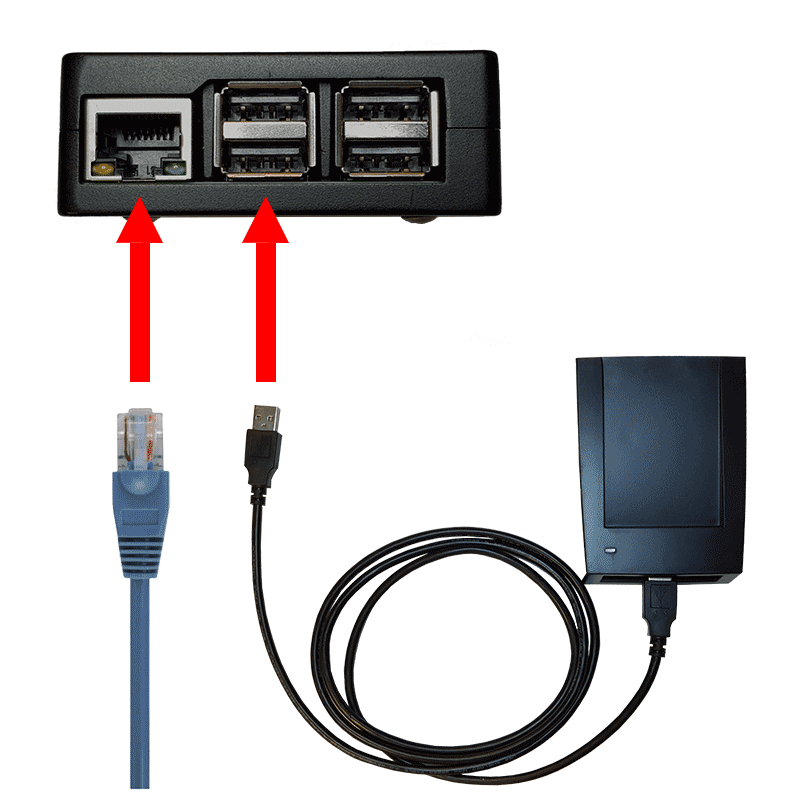 You will need a CAT5 or CAT6 Network cable (not supplied), one end connected to the Network port on the GateKeeper, the other end connected to an Network port on the router or a switch. Please ensure Internet access for this connection. The GateKeeper can operate for short periods in Offline Mode during a network outage as long as the GateKeeper and facility network components have electrical power. It is strongly recommended to use an Uninterruptible Power Supply (UPS) to maintain constant power for the GateKeeper, Internet router and all network components. The GateKeeper network port has LEDs at the bottom left, and bottom right corners. When powered, connected to the router and successfully connecting to the Internet, we would normally expect to see the bottom left LED as a flashing green light. The bottom right LED can be a solid orange light, or not powered, either are fine. Desktop readers and receipt printers are connected by USB cable to one of the USB ports at the front of the GateKeeper. Only one receipt printer can be plugged in at a time.